You may recall that I pruned the lavender hedge. Actually, I hacked it back quite a bit, because lavender has this habit of getting really woody and dead inside, and every now and then you just have to whack it back into shape. That was last Sunday. I still need to sharpen the shredder blades and get to work chopping that stuff up. It'll be nice to have some fresh chips for mulching in the garden. Today I spent an hour or so weeding the Bermuda out of the centers of the plants, then pulling back some of the dead Bermuda around them to clear a patch. It's not easy work, but it can be very satisfying. I'm slowly clearing it away to expand the rose bed and to work out some more planting behind the roses on the driveway side (on the non-driveway side, I want to put in a circular patio around the magnolia). 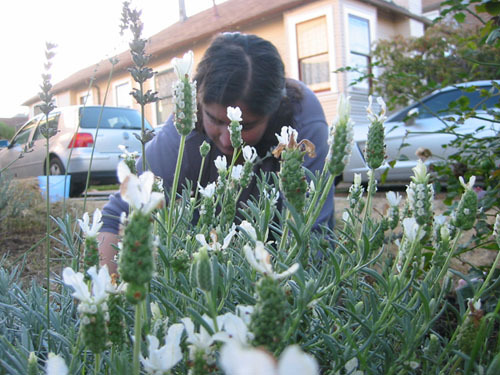 And afterwards you smell like fresh lavender and damp soil, which is quite a nice smell. mmmm...lavender. Sounds dreamy. I don't think we have that here in Marrakesh. My lavender is obstinately refusing to get bigger. It's not languishing, it looks reasonably healthy, is blooming here 'n' there, but it hasn't changed in size since we moved in. 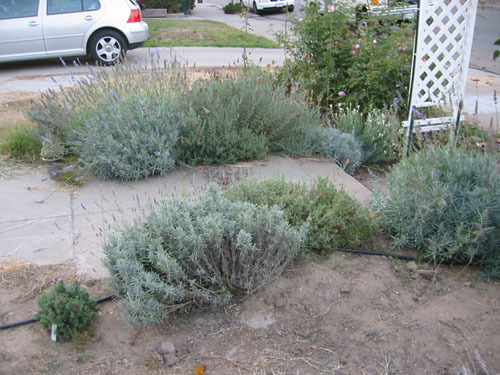 Full sun, gets water...I am jealous of your lavender hedge. Well, you haven't been there long. Keep in mind that this lavender hedge has been here for three years. It takes a while for it to settle in and get going, but then it takes off. 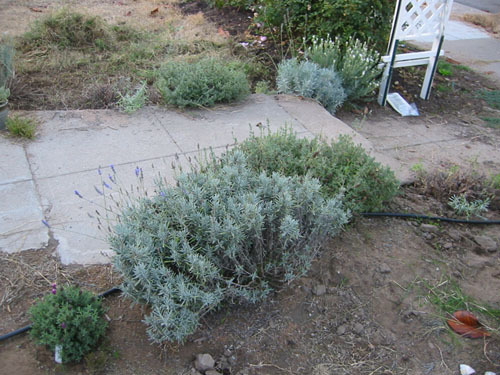 For example, here's the freshly-planted lavender on March 27, 2004. By May, we had a tiny bit of a growth spurt, but not much. It was really last summer when it started to get going.